Working with tremendous effort and scope of growth, we are engaged as manufacturer, supplier and exporter of Four Probe Set Up in Roorkee, Uttarakhand, India. Our firm specializes in offering a distinguished apparatus for Four Probe Set-Up (Mapping) that is conducted to measure resistivity. This specific range is widely accepted in national and national market for their defined features. To maintain industry defined quality standard, we manufacture our offered range using progressive technology and superb quality raw material. Additionally, the offered range is also tested thoroughly at every stage of production to avoid possible flaws. The current source is suitable for the resistivity measurement of low to medium resistivity samples such as thin films of metals/ alloys and semiconductors like germanium. 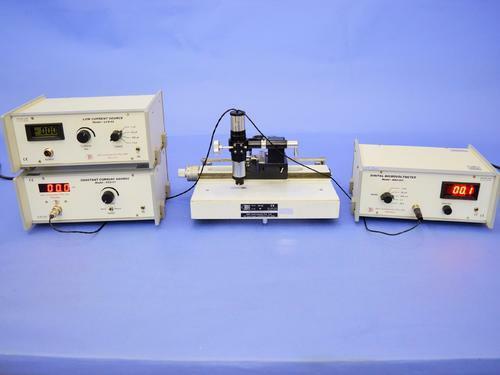 This current source is especially suitable for the resistivity measurement of polymer ceramics and Si cryustals.